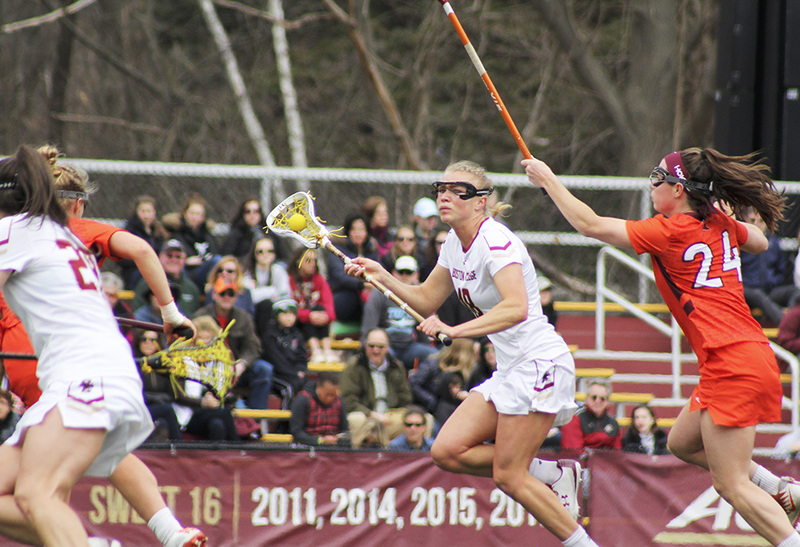 Trading Places In her first two years at BC, Dempsey Arsenault was a star defender. Now, she helps pace the offense. 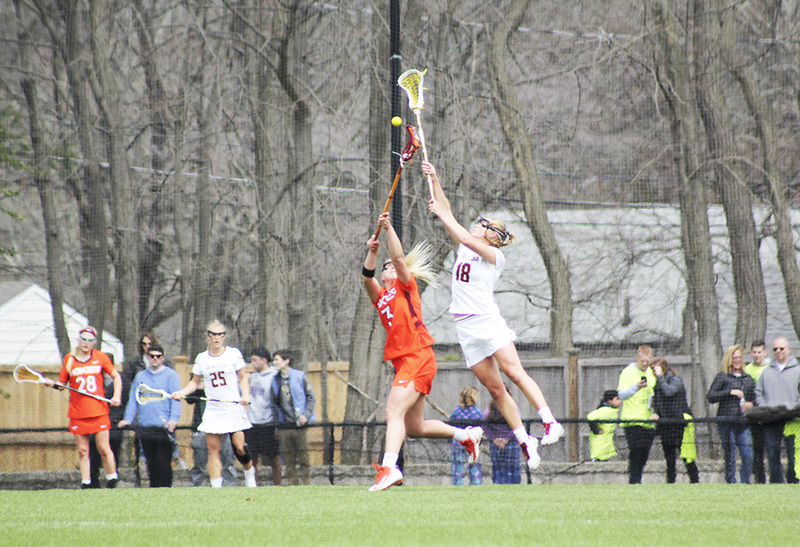 With 1:02 left, Dempsey Arsenault found herself with a free-position chance, in a tie game, with Boston College lacrosse’s undefeated regular season on the line. With 16 free-position goals on the season, Arsenault seemed like the perfect candidate to vault BC back into the lead against Syracuse in the final game of the regular season. She wound up and fired a near-perfect shot toward the corner. Syracuse goaltender Asa Goldstock didn’t have a chance. Yet, somehow, the ball just slammed against the crossbar—and it slammed against it. The net shook, as if it was stunned the ball hadn’t found twine, but the white orb just bounced away harmlessly. This is not a story about that shot. It’s about what came after. To help frame how remarkable Arsenault’s 2018 season has been, let’s return to the free-position goal tally: 16 on the year, the most on the team. Arsenault is tied for 74th in the nation in free-position shot percentage—she’s gone 16-for-32 on the year. Relatively impressive on its own, but in the context of the lacrosse player she’d previously been for the Eagles, it’s actually shocking. In all of 2017, Arsenault scored 15 goals. In 2018, she has more than that from a single specific game situation. The junior from New Hampton, N.H. has been one prong of the offensive trident that has fueled BC’s program redefining season. She, Sam Apuzzo, and Kaileen Hart have combined for 259 points. Apuzzo and Hart were expected to put up excellent numbers: Apuzzo had 119 points in 2017 and Hart had 75. Arsenault had 23 a year ago. This season she has 81 and the NCAA tournament hasn’t even begun yet. So—what changed? Both Arsenault and Walker-Weinstein cited a preseason meeting as the critical point when Arsenault completely realized how drastically her role was about to change. “I was meeting with the coaches and they said, ’cause they know I don’t like being the center of attention, so they said ‘We need you to step up and actually go for it, cause [not scoring] is kind of like being selfish,’” Arsenault said. In the past, Arsenault had thrived on making the right pass and serving as a ground ball hawk on the defensive end. Her point totals were somewhat deceiving in terms of conveying just how important to the the team she was: Instead of taking shots, Arsenault was grabbing 48 ground balls and draw controls apiece, triggering the attack from the rear rather than finishing it off up front. At the coaches meeting, assistant coach Jennifer Kent framed the situation as such: Her daughter, Kenzie Kent, had to learn that scoring was what was best for the team, even if it meant she needed to concentrate on scoring rather than singularly focusing on creating for her teammates. This was eye-opening for Arsenault. Walker-Weinstein sees it the same way. When both parties shared their visions for what the season would be, how the coaches felt really surprised Arsenault. “We shared each others’ visions—what was her vision for herself, and then we told her what our vision was,” Walker-Weinstein said. “They didn’t quite match up just because she’s so humble, but we told her that she is one of the best players in the country alongside her best friend [Apuzzo], and she looked at us like we were crazy. You know, [assistant coaches Kayla Treanor and Kent] have done a great job of pushing her physically on the field, and I think she’s starting to realize it. It was Treanor who urged Arsenault to switch her mentality when it came to shooting the ball. It turns out, Arsenault didn’t compromise on her more selfless vision, either. As good as she has been at generating points for her team, Arsenault has evolved into a two-way monster. Despite the shift to a more offensive role, she’s still scooped up 51 ground balls to lead the team and won 86 draw controls—Apuzzo is the only Eagle with more—in 2018. This season has completely unlocked every aspect of Arsenault’s game. Arsenault—a three-sport star in high school—has always been athletic, but she tore her ACL at the end of her junior lacrosse season. Instead of allowing it to serve as a setback, she dedicated all her time to playing wall ball every day to improve her stick skills and refine her abilities even though she was sidelined. Kent and Treanor had to work with Arsenault to push her to another athletic level, but in a sense this was the culmination of the junior’s recovery from her injury. Her first year back in high school, she played on the attack to ease the physical load in the aftermath of her injury. By the time she arrived on the Heights she returned to the midfield, but her more defensive role still didn’t enact the physical toll she’s faced this year. The results of her hard work over the offseason speak for themselves. Arsenault kicked off the season with a hat trick against Notre Dame, has scored five goals twice in 2018, boasts 12 games with at least three goals, and has notched at least five points in 10 games. On the defensive side, she’s had seven games where she’s nabbed at least four ground balls and 10 games with at least four draw control wins. Arsenault ultimately identifies herself as a grinder from her previous roles—that of ice hockey and field hockey stardom in high school—which helps explains how prolific a passer and ground ball player she is. In the end, though, she credits Walker-Weinstein with always pushing her to reach her potential on both ends of the field. The other two prongs of the trident have play a big role in her success as well. When it comes to inspiration on the field, Arsenault goes back to her teammates again. Both she and Apuzzo credit their chemistry to their friendship on and off the field. “Dempsey is my best friend,” Apuzzo said. “We live together, I spend every waking moment with her, so our connection is so great. She’s the nicest person I’ve ever met in my life—so genuine so sweet, she loves to have fun—she’s awesome. The ultimate fuel for Arsenault’s breakout, though, is the trophy she can see on the horizon. Walker-Weinstein understands better than anyone just how much is asked of Arsenault on both ends of the field. “She was so successful [on defense], and then we had to push her into midfield and then we had to push her into goalscoring,” Walker-Weinstein said. “I think those two years on defense really cemented her confidence, which I think is what has allowed her to be the player she is now. Given all of Arsenault’s success in 2018, the free-position miss against Syracuse was shocking. Unsurprisingly, her mentality is the reason she rebounded so quickly. After coming so close to sealing an undefeated season, Arsenault didn’t let the crossbar prevent her from taking her moment of glory. As the sun set over the Newton Lacrosse Field, game time slowly ticked away as timeout after timeout was called down the stretch. Finally, a mistake by Goldstock gave the ball back to BC with 21 seconds left. A timeout from Walker-Weinstein left Arsenault double-covered against the sideline at midfield needing to get the ball to the goalmouth as quickly as possible if the Eagles were going to secure a game-winning goal. So, as the ref prepared to begin play, Arsenault began to cradle the ball as if she was going to pass it back to her defenders. When the whistle blew, she faked the pass, and both Syracuse defenders completely bit on it. Arsenault was gone in a flash, streaking toward goal. She didn’t score—she didn’t even end up with the assist on Apuzzo’s game-winner. After two years of grinding on the defensive end, chasing ground balls and draw control wins, the biggest success of her career wasn’t the goal or even the assist—if it had been it almost would’ve been disappointing. Few players are willing to commit themselves so completely to their role, no matter what—never mind being so committed regardless of how much glory they receive for their work. 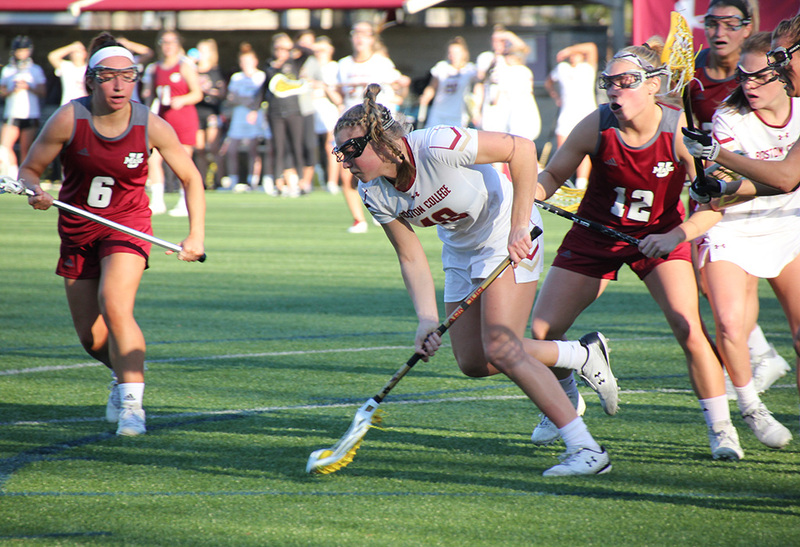 Arsenault has played every position on the lacrosse field except attack—she’s embraced being a defender, embraced being a defensive midfielder, and, once it became clear her teammates needed her, one of the Eagles’ most potent weapons. Even as a vital part of one of the most prolific offensive teams in the country, it’s the little moments that have defined her career and her breakout 2018 season.